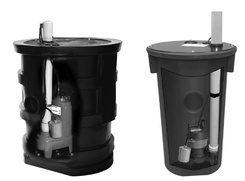 Goulds GWP Plumber Wastewater Package Systems with PS and PV Pumps Pump/Basin Packages come fully assembled from the factory for simplified installation. The structural foam cover is strong and corrosion resistant. Vent grommets for both 2" and 3" vent provided. Adds system flexibility and reduces inventory. Applications include homes, rural water districts, parks, dewatering, wastewater, 2" solids handling, sewage lift stations, waste drainage below sewer line.